The former Drancy village used to have an earlier church called Saint-Germain-of Auxerre. The church became too small to accommodate the influx of the new population so a new church replaced it. 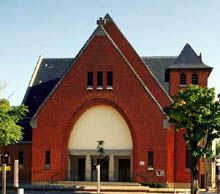 It is the most recent of the three churches in Drancy related to the construction projects by cardinal Verdier. The new building was dedicated to the religious reign of Louise of Marillac (1591-1660), a nun who worked with Saint Vincent de Paul. She is the founder of the first order of non-cloistered nuns and devoted her life to the needs of the poor. The sisters of Charity have been present in the town of Drancy since the nineteenth century. They were in charge of the dispensary, which is today run by the Red-Cross. Composed of a slate-roof and red brick, the building was constructed from 1936 to 1939 according to the plans drawn up by the architects Besnard and Bernadac. As for Saint-Jean-the Evangélist, the church Sainte-Louise-de-Marillac remained unfinished for a very long time. But the bombing of August 1944 heavily damaged it and after restoration it was endowed with a bell tower and a porch but ornament was never completed. The aisles flank a vaulted nave with wide and short cross-beams. The choir is decorated with a large mural in honor of Louise of Marillac. Three abbots from Drancy, who died on the battlefield in 1940, are buried in the chapel.